The first show in Aurora went really well... with a small but really great audience who were into it from the start. The second show was a much more mysterious affair. A group of twenty people failed to show up - presumably because they were wandering around Aurora trying to find the theatre, unaware that the unassuming red-brick building with no signs and no show-advertising was what they were looking for. For the first half hour there was almost no response at all but ever so slowly they started to thaw and by the end of things they were behaving as an audience. Maybe it took them time to adjust to my rhythm or my accent or maybe I started the show in an overly earnest manner or... or who knows. It came good in the end. I stayed to chat with a few of the audience and a few of them commented on how little promotion they'd seen locally so at least I'm not imagining things. There is however a great review in today's Aurora Beacon News which should help. I'm incredibly flattered by any comparison to Bill Cosby and surely it's a rare thing for a reviewer to tell the readers that he's going to go and see a show again and that he actually intends to pay for a ticket! I've added the full review to the reviews page. I think I must have gone on a bit too much about the rock and pebble balancing that I've been up to... a Canadian chap who's obviously been reading this page has sent a parcel to the theatre here in Aurora containing some pebbles. Well I know one more thing about Aurora and that's that it is home to a hotel that stinks of sweat and other bodily fluids. I'd never walked into a hotel room and been quite so knocked back by a stench before. Hmmm. Curious that someone might recently have died in my room I visited the room of my Slovenian Tour Manager (he's Slovenian, not the tour) and discovered the same aroma was there also. First purchase: air fresheners. Lovely. Cleveland ended on a nice note with a great final show on Sunday afternoon to a small but really enthusiastic audience. They even had the good grace to applaud as I entered, unlike one of the Saturday audiences. The marketing here in Aurora isn't filling me with much hope. I haven't seen any. The first thing I saw when I arrived at the smelly hotel was a poster for a show in the Copely Theatre after me. I can't help thinking that a poster for my show wouldn't be a good idea. I haven't seen a poster yet and there's nothing outside the theatre to announce that it exists or that the show is on. Hmmm. I went in to Chicago yesterday to do some press for the show, appearing on a radio show hosted by Mancow (presumably he's so named because he speaks a lot of bull) and on another, friendlier show hosted by Steve Cochrane. The Mancow was an amazing experience. He has a bunch of sidekicks, including one called Turd. Mancow (I don't know his real name) would fade the microphones, say something offensive, then fade them back up again and point at Turd who'd then repeat the comment as though it was his own idea. While discussing the horrible news story about the US soldier, Lynndie England being sentenced to gaol for abusing Iraqi prisoners (Mancow thinks she should be released because she's "retarded" and after all, "who really cares about the Iraqis?") he faded the mic and said, "I love retarded girls... they're easy... they always say 'yes.'" Then he faded the mics back up and pointed at Turd who repeated the comment so that Mancow could then respond to it. It was all pretty repulsive. I don't think Turd offered one comment of his own during the time I was in the studio. What kind of job is that? Sitting in a studio saying offensive things that someone else has told you to say? While I can't imagine many Chicagoans are keen on travelling out to visit a city like Aurora (I believe there's quite a lot to do in Chicago as it is) the best press I've seen so far has been in Time Out Chicago. I haven't seen last week's issue but I'm told there was a big feature on the show while this week it gives me the red-star of recommendation and there are a few nice words... in fact it explicitly states that it's "worth the trip to the burbs." How many people will make that trip remains to be seen. All in all, I doesn't feel as though the venue is trying to sell it to the people of Aurora... in which case I'm sure it would have been easier to take the show to Chicago. Odd. It's been a relatively eventful few days in Cleveland. The theatre has a seemingly endless supply of pensioner-ushers all of whom seem to be very jolly and good at their job. A few days ago however one of them apparently lost it when watching the show as I was discussing Creationism. He started to rant and rave at the barman about how far out of left-field I was (yes, with my irrational belief in mainstream science and distaste for liars) and was eventually asked to leave the building. Odd. While the show has gone down well in general yesterday saw one of the hardest shows I've ever had to do. The matinee performance seemed to be ill-starred from the beginning. We had a different House Manager on duty and somehow he seemed not to know what his responsibilities entailed. The audience were left sitting in silence for a minute waiting for him to make an announcement and the show was started with people still at the bar and with the back of the theatre all lit up. Each of these things is trivial in its way but there's a reason that things are done one way and not the other and it doesn't help the atmosphere to do it badly and if the theatre doesn't behave professionally it tells the audience that the show they're about to see isn't professional either. The cues at the top of the show were then a little late and somehow all of this led to me walking on stage to no applause... which is odd not because I think I deserve some kind of huge ovation, but theatrical convention would normally see a performer welcomed on to the stage. The atmosphere didn't improve much from there. It's very strange when you're saying words that have made tens of thousands of people laugh before, in the order in which you normally say them and with the passion and feeling intact and get blank stares back from people who can't imagine how on earth these words could ever be deemed amusing. There was an evening show a short while later which proved that the story hadn't suddenly been rendered unfunny so how is it that one audience can be so radically different to the others? Was something missing in my performance? Is the House Manager's announcement really so vital that it throws every other part of the show out of whack or is there some weird chemistry that will undo one show every 300 performances? Odd again. There's one more show to do this afternoon and then we fly to Chicago and then drive on to Aurora. The only thing I know about Aurora is that it's where Wayne lived in Wayne's World. There are another couple of reviews of the Cleveland shows. The Free Times summarises the show, almost forgets to say whether he likes it or not, reviews the seating in the theatre (he's right though, the cabaret style seating is a huge annoyance and completely inappropriate to my show) but finally adds that the show is good enough that you will forget that you're in a strange and uncomfortably arranged seat. Scene is a bit more quotable describing it as a "sides splitting journey" and a "cracking good time". Both have been added to the reviews page. My recent rock and pebble balancing has inspired me to try more. The pebble balancing is much harder. When you pick up a rock you have much more sense of its gravity and weight but the pebbles are so slight and it needs a far steadier hand. 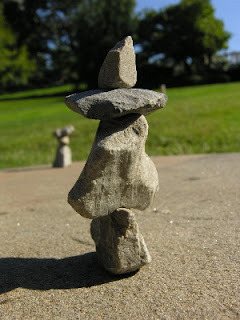 I went to a park with a friend and between us we built a veritable stone-henge of miniature structures. I was quite happy with this stack although there's no way of knowing that it is built out of tiny pebbles - in the photo it could be six feet tall rather than under two inches. However, a caterpillar lends some nice perspective to this one... unless of course you think there are giant caterpillars roaming around the parks in Cleveland in which case, yes, that stack could also be huge. 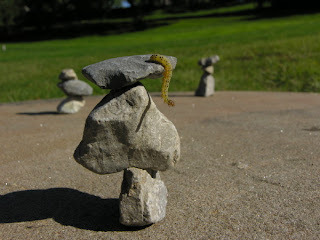 I was going to call this photo Pillar but my pebble-stacking friend suggested I call it Graduation instead which is much better. I've been very happy with the way the show has gone down in Cleveland so far. I seemed to do 4 or 5 interviews a day all through the first week and the reviews of the show have been great and it's gone down really well most nights with 2 or 3 standing ovations along the way but, even with all that on its side, we haven't exactly set the box office alight. It seems I'm being stalked by vicars. The last two shows both had men of the cloth sitting on the front row - which seems like an unlikely incidence. I asked them both about their views on Creationism, one declined to really answer but the other told me in no uncertain terms that he was Creationist. I'm not used to meeting this opinion... I've spoken to several men who share their profession in the UK, both during and after the show (and outside the confines of the theatre as well) and never found any of them to be of the Creationist persuasion. It's such a minority point of view at home that it is very difficult to take seriously. All through the last show, my paranoid mind was thinking that that day's vicar had been sent especially to check the show out because word of the show's anti-creationist material was out. (In actual fact, I'm very careful in the show to point out that it is the lie I believe I was told and the failure to whack his Google that actually earned my ire, not the belief in Creationism. One of the other people I met in the journey was also a Creationist... he's read the book and seen the show and we remain friends, so I'm confident that I've made this point clear in the show. But paranoia can always get you when you're on stage. I'll start an official vicar-watch and let you know if any more turn up. I managed this stack which was okay but I don't think my heart was in it and the result is somehow a little unsatisfactory. On the way home, I stopped in a small and pretty town called Vermilion and visited the beach. 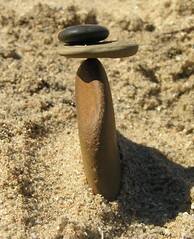 I decided to try balancing some pebbles instead (maybe, I can market this as Pocket-Rock-Balancing!) and achieved a Zen-like calm in building this inch-tall stack. With my new sense of calm I then tried again with bigger stones and was very happy with this triptych. 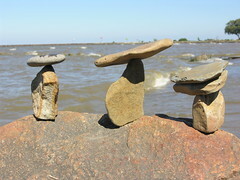 The middle of these was particularly satisfying as the top stone would move constantly in the breeze but seemed like it would stay in place for ever. It was certainly still there when I left the area a couple of hours later and returned to Cleveland for tonight's show. I'm going to be writing a short weekly article about touring the States for the Guardian. Initially I refused to do this until they agreed to change the size and design of their paper but I'm told they have finally complied with my demands and so I've written my first piece. I think the articles will run on Saturdays and I think the first one will be in this week. My only concern is this: Once the press started writing about Gorman and friends' googlewhacks, references to those particular word combinations started showing up on numerous Web sites, making their unique googlewhack status null and void. So as Gorman tells his story in his current show, how does he show the googlewhacks as single Google results on his laptop? He may be taking creative license with his PowerPoint graphics. Or, maybe he captured the Web pages of single Google results years ago, after he and his pals found the unique word combinations and before the rest of the world knew about them. What an odd concern to have. Surely it's obvious that the last sentence explains the situation perfectly ... in fact it's the only rational way it could have happened. The rest of the world (well, not all of them) only knew about the googlewhacks because of the show... so obviously the show existed first and that included the images. Her concern only seems to make sense if there is a way in which my story could be known by the world without me being the one who's telling it. How odd? It's hardly a chicken-and-egg style mystery is it? The second show here in Cleveland seemed to go over well but I was frustrated because I felt let down by many technical things and I know that had they gone right the audience would have had a better time. Another event had taken place in the theatre that afternoon and it seems that some settings on the projector and on the desk had been reset. This meant the images didn't have the quality they should for a professional show and the sound effects that accompany the pictures were incredibly quiet too. There were a few times where I couldn't hear the sound effect so didn't know if the image had changed or not and had to have a sneaky look behind me to check rather than just rattling along with the show. If the images don't arrive with snap and clarity in a show like this it's like a stand-up comedian mumbling his punchlines... the audience still have all the information to find the humour but it just isn't as funny. Very frustrating. 15 minutes before the end of the show the sound failed completely so I was off mic for a while. It's a show that's already quite damaging to my voice so I was worried about the damage I might do to myself trying to fill the room without amplification but when you're in full flow there's not a lot of choice and you just have to carry on. It made for a rather odd ending. When the show ends, the lights come up and some music plays and people take their cue and leave. Of course with no sound there was no music and even though the show was clearly over and the house lights were up some of the audience found themselves sitting watching an empty stage for a while. I'm not sure what they thought was about to happen. Hmmm. "I can urge you to get out of the house and away from your computer (as far away as possible, if you know what's good for you) and to get to the theater to bear witness to one of the most whimsical, profane and marvellous evenings"
The key word being "something"
Cleveland is a much bigger city than Napa and with much more media available it means I have a much heavier schedule of interviews - and hopefully - bigger crowds as a result. This morning I did a series of interviews on a bunch of radio stations that you'd only really find in America. Starting at just after 7am I was on WMMS (Rock) then WGAR (Country) then WTAM (Talk) and WMVX (Mix) - all within a space of 90 minutes before travelling to WKYC - the local NBC affiliate for a TV show called Good Company. And I hope I was. Even if I was looking like a scruffy tourist. The show did get off to a good start on the first night. There was a nicely fullish house and generally there was a great reaction. There was definitely some discomfort in the room when I was discussing Creationism although I can't quite work out the nature of it. But it didn't seem to do the overall reaction any harm and there was something of a standing ovation at the end. I wrote yesterday about the rare pleasure of a home-cooked meal while on tour so you can imagine my delight on arriving at my Cleveland hotel this evening to discover a kitchen! It's not the best kitchen in the world but at least it means that some simple food can be rustled up now and again. And that a 3am sandwich is available. And toast. This is exciting. 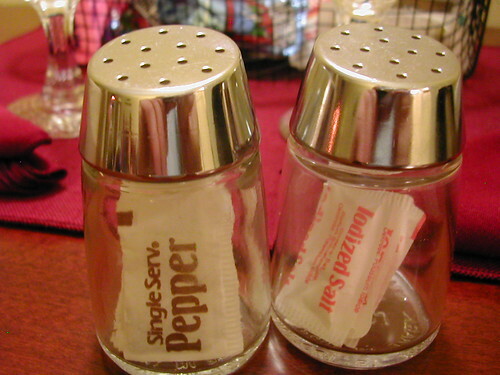 As there's a kitchen there are also some basics - such as salt and pepper - provided. Now, if you were trying to give weary travellers the feel of home, would you choose to give them salt and pepper pots or would you make do with those tiny sachets of individual servings? It's a difficult choice isn't it? Perhaps this is the ideal solution. The mind boggles. 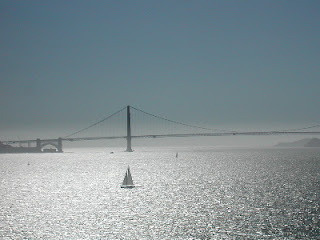 My break in San Francisco is almost at an end - I fly to Cleveland tomorrow where the tour continues. I'd almost forgotten that there was a reason I was in the US. 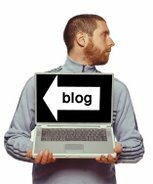 On August 28th I wrote about the show being visited by one of the googlewhacks that I met in the adventure. The reason that David and Danielle (aka Unicyclist Periscopes) were able to get out to the show in Napa is that they no longer live in Washington D.C. having moved to Palo Alto which is not far from San Francisco. This also meant I got to spend some more time with them during my break. We visited a baseball game (v. exciting) and I also headed out to Palo Alto for my first home-cooked meal of the tour (even more exciting) and a trip to the cinema to see the wildly funny and liberatingly rude Aristocrats. This won't mean a great deal to you unless you've seen the show or read the book but I was really delighted when Danielle presented me with a second Teeny Google. 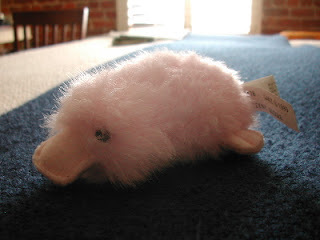 She seems to have an uncanny knack for spotting these things in unlikely places (this one was alone in a stationery store where the owner had no recollection of having ordered it) or maybe the world has an uncanny knack of placing these in her path shortly before we meet. 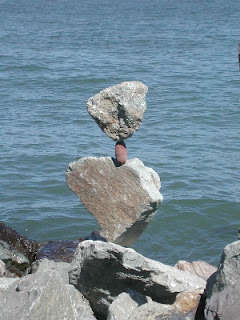 Today as I walked along the coast I found myself at the spot of my first rock-balancing and decided to have another go. I doubt I'll ever be able to balance things with the beauty that Bill Dan manages but I was still quite impressed with this stack - the second from the top was really quite small and difficult to place. Maybe I'll give everything up and start a new life as a rock-balancer. Or maybe I won't. I'm enjoying my break in San Francisco. 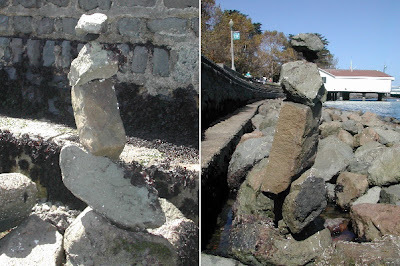 I cycled over the Golden Gate Bridge into Sausalito the other day where I saw a man called Bill Dan balancing rocks on the shoreline. It's really beautiful. 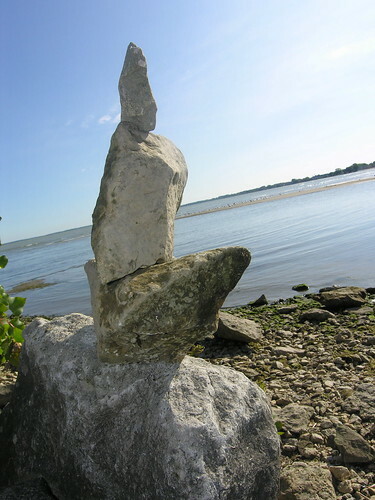 The next day I felt compelled to have a go at some rock-balancing myself. I managed this stack of five which isn't anywhere near as beautiful but was very satisfying all the same. Simon Singh has an amazing knack for writing about complex scientific ideas in elegantly simple ways. It's his ability to find the human stories behind the science that makes this so readable and you find yourself picking up an understanding of things at the same time as you're turning the pages to find out what happens next.